gThankYou! 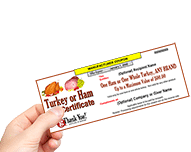 Turkey Gift Certificates allow recipients to choose any Brand of whole turkey, from virtually any Grocery Store in the U.S. The perfect corporate turkey gift solution for companies with distributed workforces. Recipients choose the turkey that works best for their family, at the store they would like to shop. gThankYou Gift Certificates are single use Manufacturer Coupons with no cash value and no residual value (unlike gift cards or gift checks). At gThankYou we make your purchase easy, fast and affordable! Order online or by phone at 888-484-1658. Nearly all orders ship the day they are received with delivery as soon as the next business day. Worried about an important deadline? Let us know when you’ll need your Gift Certificates and we’ll ensure they arrive on time. gThankYou Gift Certificates are available in amounts from $5 to $30. Simply choose the Certificate value that fits your needs. Interested in large volume discounts? Call 888-484-1658. 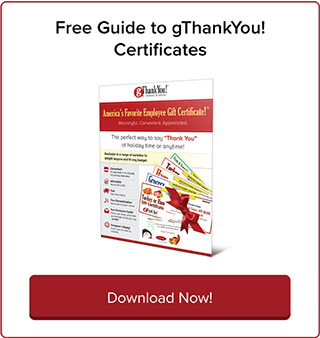 Make your gThankYou Certificates more meaningful with our free custom Enclosure Cards! Choose from dozens of designs. We can add any message you want and even your company logo! You receive a proof by email to make sure you love your selection. We ship your Enclosure Cards the same day with your order - FREE! Click to see our Enclosure Card design catalogs for Autumn & Thanksgiving and the Winter Holidays. gThankYou! Turkey Gift Certificates are the perfect corporate turkey gift for the holidays! We make it easy and affordable for you – regardless if you are centrally located or have a large distributed workforce. To learn more about our volume pricing discounts and options for customized online ordering, please call us at: 888-484-1658. "I love gThankYou because of the ease of ordering, the quick turnaround, and the awesome and very friendly help I have always received since the very first time I ordered. I also love that the Certificates are personalized, easy to distribute to my employees, and accepted almost everywhere. The free Enclosure Cards are icing on the cake!"